It’s hot as heck out there, and with the heat likely to continue well into September, you need to find affordable, family-friendly activities that keep the kids active, give you a chance to relax and keep the whole family cool. All of the activities on this list are free or affordable, so if you’re wondering where the water parks are, we felt like giving your pocket book a break after all of the great summer activities we recommended in our recent Community Blog on Summer Festivals. To make your swim day that much easier, we’re offering a $100 Visa Gift Card in our 123 Dentist Fan of the Week Contest. Take a gander below and let us know your favourite swim spot on the list. Then go enter our contest and get three bonus entries just for reading and commenting. If you’ve already entered the draw, you can still get the bonus entries. Salt water, sun bathing and real waves. Not to mention a huge open space for dogs and activities like kite flying or building sand castles. Why do we love the beach so much? Maybe it’s the smell of the ocean, the open air, the sites and sounds of nature or the lack of mosquitos, leaches and chlorine. Maybe it’s just that it inspires our imaginations and stimulates our minds in a way that a pool or lake can’t measure up to. Whatever it was, not all beaches are created equal, and in Vancouver where beach season is short but sweet, its important to know where to spend one’s time. 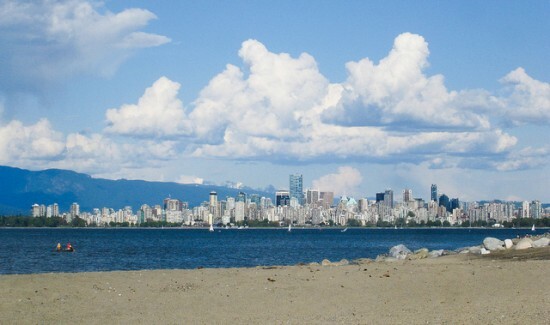 One of Vancouver’s most iconic and popular destinations, the Spanish Banks in Vancouver is a popular, but big and beautiful relaxation destination. Volleyball courts, picnic tables, and access to the seawall that stretches all the way around False Creek, you don’t even need a car if your family is equipped with bicycles. Located at Boundary Bay Park, Centennial Beach is a vast, sandy stretch that is great for a day of activities including bike riding, a long walk, picnics and water sports. Families love Centennial’s shallow waters, which are warmer than most Vancouver beaches. It may be a bit of a trek out to Delta, so make a day of it and enjoy every second. 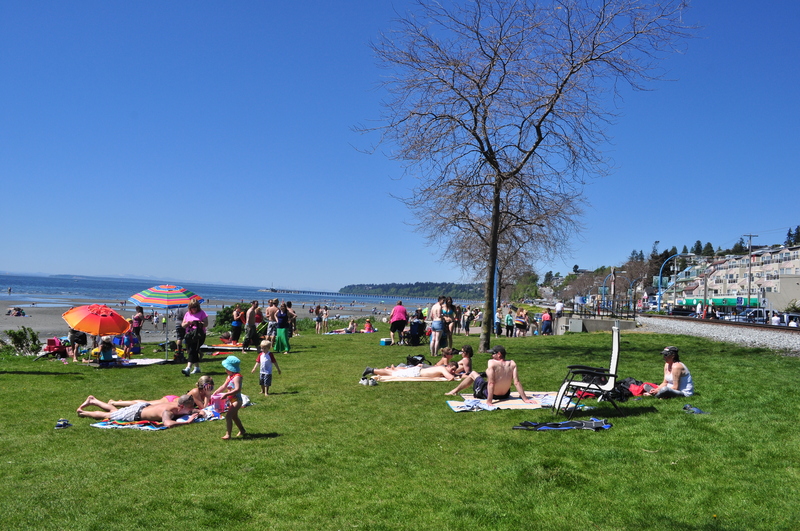 White Rock is the lower mainland’s only true Beach Town, so it’s no shock that this is one of the most popular tourist destinations as well as a local hotspot. Great restaurants dot the shore line for blocks while a long stretch of sandy beach and affordable parking make spending the day convenient and calming. Located right next to the US boarder and the Peace Arch, East Beach has the easiest access to shopping and restaurants, just don’t accidentally cross the boarder! Nothing refreshes quite like a swimming hole. For the sake of this blog, we’ll classify this category as a a fresh water swim spot that’s contained inside a river or inlet. Remember hiking to that secret, peaceful oasis with your childhood friends? Well now you can introduce your own brood to the wonders of nature off the beaten path. Here are some of the more frequented, but still relatively peaceful, places to cool off like only a West Coaster can. 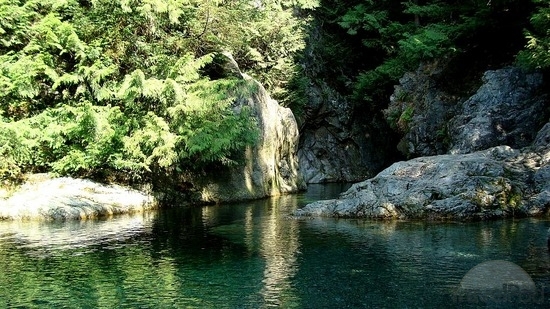 The river valley in North Vancouver boasts quite a few options for those looking to experience chilling glacial water. There’s something for everyone, from shallow, calm areas for children to cliffs and waterfalls for the more adventurous and experienced swimmers. It’s a popular destination, but the multitude of options makes finding a peaceful perch easier than you’d expect, plus the walk in is a site to behold. 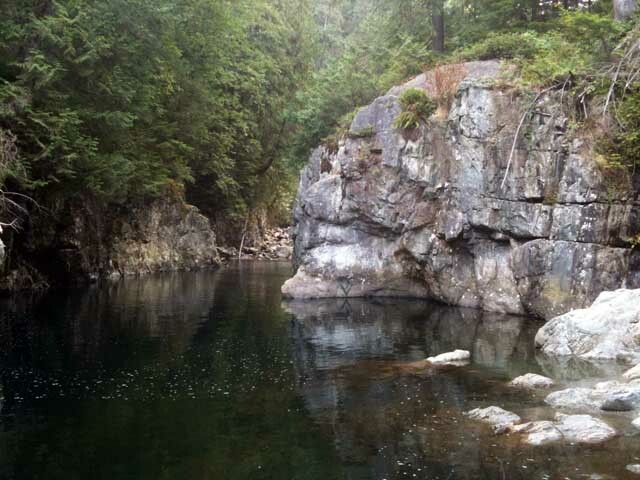 Trek a ways off the beaten path in Lynn Canyon to find one of the regions most popular and best kept secret watering holes. 30 Foot Pool is popular with youth and families alike for it’s beauty, deep, pristine waters and yes, even for the trouble it takes to get there. Don’t expect to be the only ones with this great idea, but if you get there early it’s well worth the hike in. For those of you who are a bit more adventurous, Pool 99 is a popular spot for cliff divers and local youth looking to get off the beaten path. That’s not to say it’s not a good family destination, but it’s certainly worth the trip for families who are looking for something new. Located in Lion’s Bay. Serenity given physical form. Stillness, beauty, majesty. All interrupted by a child jumping off a rope swing or a dock. The water is fresh, warm and deep, for those who find the ocean a little too dirty. A lake is a great place to experience all sorts of water sports, from a trip in a canoe to snorkelling for the first time. A swim in a lake is a wonderful companion to a hike or a camping trip on a summer long weekend. Just watch out for those mosquitos! Want a sandy beach with fresh water too? Alouette Lake in Golden Ears Provincial Park east of Maple Ridge and you can swim in the calm waters of a pristine fresh water lake or find a nice section of Gold Creek for something a little more exciting. It’s a trek to get there if you’re not in the Valley already, but well worth it. Head up towards Whistler near Squamish and you’ll find two popular, excellent swimming areas about an hour from Vancouver. The journey is not better than the destination in this case, because this is one of the best swim spots in the country. Careful though, it’s crowded in the summer, so investigate some of the nearby alternatives, there are many! 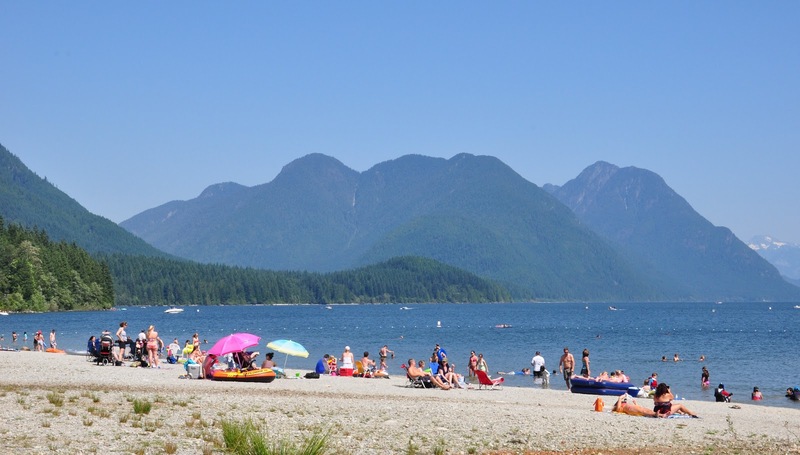 Located in Belcarra Regional Park in Port Moody, White Pine Beach is a smaller, yet popular choice for locals to enjoy the fresh water, fun and nature only a lake can offer. The surrounding park also offers many other activities and the proximity to Coquitlam means you’re never too far away from home. With this beautiful summer weather, one can be forgiven for overlooking the indoor swim spots on this list. But make no mistake, there are plenty of good reasons to visit an indoor recreation centre for a cool down. Indoor pools make enjoying a hot tub or Sauna in July a possibility, and it’s a safe place to let children rome free while you enjoy a more relaxing soak or catch up on a good book nearby. 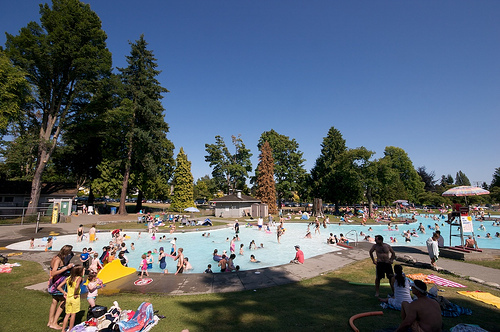 Watermania is a bit of a trek for families not located in Richmond or the surrounding areas, but it’s one of Greater Vancouver’s most popular indoor swim spots for a reason. It’s also located in the same complex as Cineplex’ Silvercity Riverport and one of only two IMAX theatres in the entire lower mainland. Trek in the opposite direction from Richmond and Surrey to find the West Vancouver Aquatic Centre. A beautiful wooden building boasts newer facilities and ‘Spray Park’ for the kids. The large windows offer a scenic, natural view of the West Coast and it’s less busy than Watermania. Like Watermania, there’s an emphasis on family at the Newton Wave Pool, one of the region’s first Wave Pools and to date the largest in Western Canada. A water slide, sauna and hot tub make this a great place for families to unwind and cool off. There’s something nostalgic about the outdoor man made swimming pool. It stimulates the part of your mind that remembers the taste of hotdogs, the smell of sunscreen and the feel of chlorine up your nose from that cannon ball you weren’t allowed to do. The outdoor pool is affordable, clean, safe and warmer than a lake or ocean. It’s the best way to get a tan while your kids play in the shallow end and in Vancouver, outdoor pool season is about 2 months longer than ocean or lake season. There are a lot of outdoor options in Vancouver, but not every one is as good. Located near the free kids water park in Stanley Park, Second Beach is an affordable, family oriented pool that children will love. Make a day of it and enjoy other activities in the park, like the Sea Wall or dinner nearby in English Bay. Probably Vancouver’s most popular and well known outdoor pool, Kitsilano is also one of the largest heated pools. Half of the pool is for serious swimmers, the other half for children and families, but the pool is so large that even on crowded days it’s big enough to stretch and frolic in the calm water. Brand new last year, the Hilcrest Aquatic Centre actually offers guests several pools in Queen Elizabeth Park, indoor and outdoor. 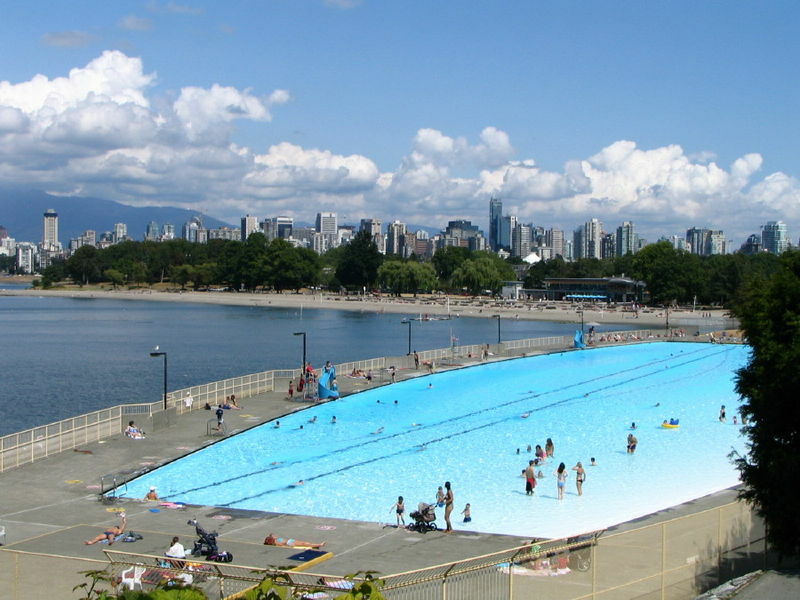 The outdoor pool has water jets and a water cannon for kids, and is surrounded by one of Vancouver’s most iconic and beloved parks. The indoor pool is large, beautiful and perfect for relaxing. What is you favourite way to refresh and cool down? Did we miss one of your favourite places to swim, and can you recommend other great locations for the whole family to enjoy? Don’t forget to enter this week’s Fan of the Week Contest for a chance to win $100 towards your next family day. Enjoy the summer, get outside and cool down every which way you can!